May has arrived again in Indianapolis. The Indianapolis Motor Speedway will once again rev up with activity, culminating in the Indy 500 on May 25. May also brings three home games for Indianapolis's newest team, the North American Soccer League's Indy Eleven. Tens of thousands of fans will attend these sporting events. Craft beer lovers will undoubtedly be among those fans. Race fans will want to bring beer into the Speedway, and Indy Eleven fans will certainly continue their new tradition of tailgating before matches. 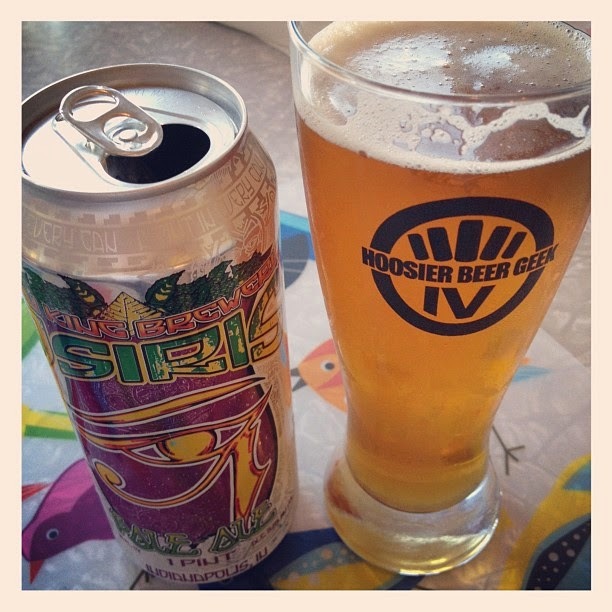 Sun King Brewing Company and Great Crescent Brewery are Indiana's craft beer canning pioneers. Sun King's three flagship brews--Osiris Pale Ale, Wee Mac Scottish Ale, and Sunlight Cream Ale--are more than worthy tailgating beers. The brewery's Fistful of Hops IPA, which offers beer drinkers the same malt base with a hop profile that changes every three months, is also tailor-made for the track or for tailgating. And there is bound to be the occasional chilly day at the track this May. Great Crescent's Coconut Porter will be a great way to keep the brisk weather at bay. Tin Man Brewing Company is canning four beers. We're most impressed with Alloy, Tin Man's American Pale Ale. Flat12 Bierwerks and People's Brewing Company are Indy Eleven's craft beer vendors at Michael A. Carroll Stadium, the team's current home. But you can enjoy their beers before the match if you bring along 16-ounce cans of Flat12's Half Cycle IPA or 12-ounce cans of People's Pilsner to your tailgating festivities. Finally, new to canning is Daredevil Brewing Company, whose production facility and pub will open in Speedway in 2015. But why wait a whole year to drink their beers at the track when 16-ounce cans of Lift Off IPA are available right now? Beer geeks celebrated when canned craft beer kings Oskar Blues arrived in Indiana last year. So it seems obvious that sixers of Dale's Pale Ale and Mama's Little Yella Pils should be on your menu of track/tailgate beers. Indeed, you have options with these two beers; you can choose the standard 12-ounce cans, or you can bring along 32-ounce monsters. And if want to split a "bigger" beer or two with your friends ("bigger" in the sense of a heftier ABV), try Oskar Blues' Ten Fidy Imperial Stout or G'Knight Imperial Red Ale. If you're looking for something on the sessionable end of the spectrum, Founders Brewing Company has a solution. The brewery's flavorful All Day IPA is available in 15-packs. Sierra Nevada Brewing Company, the progenitor of West Coast style pale ales, offer their Pale Ale and their Torpedo Extra IPA in cans. The Pale is available in 12-packs of 12-ounce cans, and the Torpedo is available in four-packs of 16-ounce cans. Sixpoint Brewery has been in Indiana for a while now and is another brewery with a heavy focus on canned beers. For your track/tailgating needs, try The Crisp, which is their Pilsner, or Bengali Tiger, their IPA. And if you're feeling adventurous, you might go with Resin, Sixpoint's lauded Imperial IPA. Bell's Brewery has long been one of our favorites. Oberon and Two Hearted Ale have been on our beer drinking menus since Hoosier Beer Geek's early days. And great news--both beers recently became available in 16-ounce cans. Evil Twin Brewing and Stillwater Artisanal Ales also have 12-ounce cans available in Central Indiana. If you're looking for an American Pale Ale, you might try Evil Twin's Hipster Ale. If you prefer something in the Saison/Farmhouse Ale category, Stillwater's Classique should do. Finally, Boston Beer Company began offering Samuel Adams Boston Lager in 12-ounce cans last summer. If you're with a group of beer drinkers who are new to craft beer, you might choose a 12-pack of this beer. Let's say that you're coming into Indy from Illinois or Ohio for the race. Or you don't mind taking a little road trip to Chicago or Cincinnati. If Cincinnati is your locale, two breweries there are making excellent canned beers. 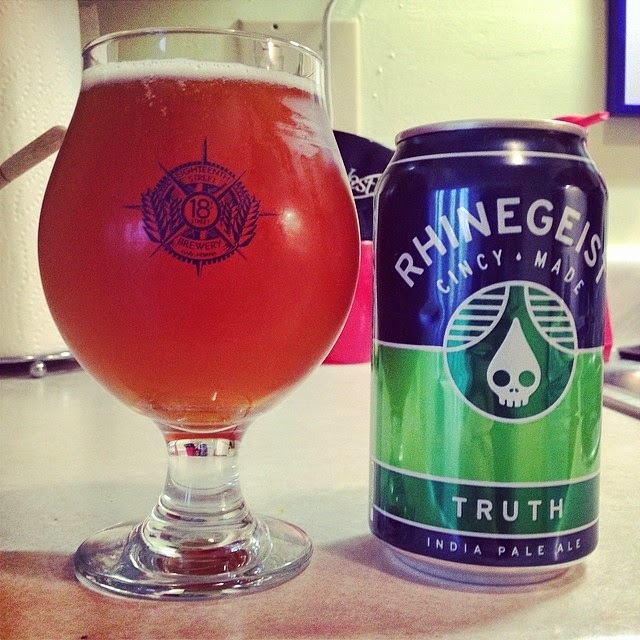 There's Rhinegeist Brewery, with their acclaimed Truth IPA and their sessionable Blonde Ale Cougar. And MadTree Brewing has been winning plaudits for their IPA, PsycHOPathy. All of these beers come in sixers of 12-ounce cans. If Chicago is where you'll be buying your beer, Revolution Brewing Company is a suggested destination for a six-pack or two. We like Revolution's IPA, Anti-Hero, their Porter, Eugene, and their tart ale, Rosa Hibiscus Ale. You might also stop at Half Acre Beer Company for 16-ounce cans of Daisy Cutter Pale Ale, Gossamer Blonde Ale, or Over Ale American Brown Ale. And if you prefer a beer-buying binge at Binny's Beverage Depot instead of a brewery visit, check out offerings in 12-ounce cans from Ska Brewing Company out of Durango, Colorado. We recommend Modus Hoperandi, Ska's citrusy IPA, and Mexican Logger, the brewery's take on a Mexican-style lager.